Often times I like to thumb though my feild guides and books and see what plants there are that I know nothing about (and there are many!). As was the case with my recent introduction to Devil’s claw or Unicorn plant. 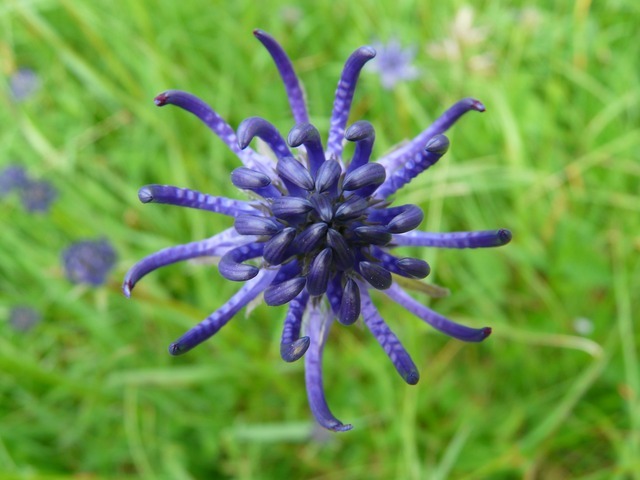 This is not to be confused with the herbal devil’s claw (Harpogophytum procumbens) from Africa but is rather a native of the dry regions of zones 10-11 in North America. 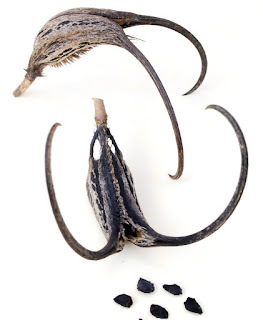 Devil’s claw gets its name from the woody seed pod that splits apart forming two long hooks that get entangled in passing animals fir thus distributing the seed. Kelly Kindscher author of “Edible Wild Plants of the Prairie” speaks of a Hopi belief that the long spines of devil’s claw drew lightning and thus rain would follow so they never weeded the plant from their fields though many other tribes ate the pods and seeds and used the fibers for weavings. The indigenous peoples of south western North America used the immature seed pods as a veggie and the mature seeds where ground for flour. The seeds are noted as having a fairly high oil content (35-43%) and a protein content of 35%. The young seed pods are gathered at one to two inches long, washed and scrubbed to remove the hairs and boiled until tender. You will have to bear with me here as I am only passing along information and have no first hand experience…yet. So I am learning right along with you. I did obtain seed and plan to try and grow this plant this year, but my references states that the seed pod has a musky odor but no reference is made to the flavor. If all goes well I can pass this information on to you later. The immature seed pods can also be pickled following any pickle recipe. I have included my favorite pickle crock recipe below. Feel free to change it to suit your personal needs. Grape leaves, wild grape tendrils, cucumbers, cattail shoots, daylily buds, carrot slices or other veggies both wild and domestic. Weigh down with plate so solution covers. Pack into jars with small piece of garlic. Strain broth, heat until boiling, cover pickles & seal. Devil’s claw prefers sandy soil and dry regions and can reach a height of roughly two feet tall. Plants for a Future offers additional cultivation and edibility information. 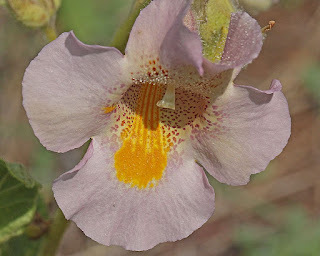 The flowers are beautiful and I did locate images at the Texas A&M web site of the seed pod and reproductive parts. Wayne’s World has the best images I have found thus far of the flowering plant and basket weavings done with Devil’s Claw seed pods. The article at Wayne’s World is also worth reading and was by far the most informative of the web information I located. Be sure to check out the weaving images as they are fantastic. The text document Front Range Seed Analysts gives some interesting information about devil’s claw as well, pointing out that the domesticated species P. paryiflora took years to improve and run true to the parent plant.